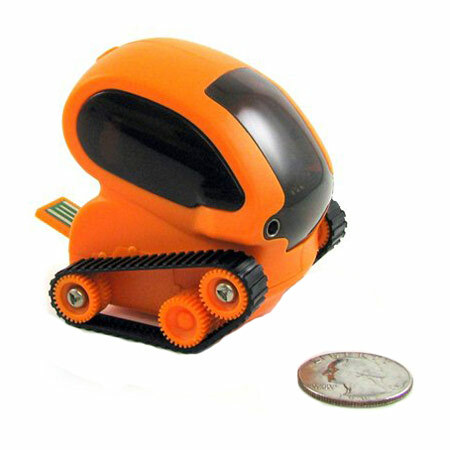 Race on the track or off-road with the orange Tankbot remote-controlled tank from Desk Pets - featuring advanced optical navigation technology. Works with iPhone and Android handsets. Tankbot isn't your ordinary remote controlled tank. 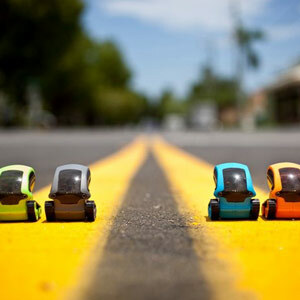 Featuring advanced optical navigation technology, Tankbot can drive effortlessly around any environment without constantly bumping into things. Three different control modes demonstrate it's incredible abilities. The first is the touchless navigation mode, where Tankbot will drive around avoiding objects or even navigating mazes. The second mode lets Tankbot roam freely, going where it wants with flashing lights and sound making it seem to have a mind of it's own. The final mode utilises the iDeskPet Universal Remote to let you manually control Tankbot from your phone. You can use this mode to do time-trials round an obstacle course, bump into people's ankles or just make sure your Tankbot keeps up with you while you walk. 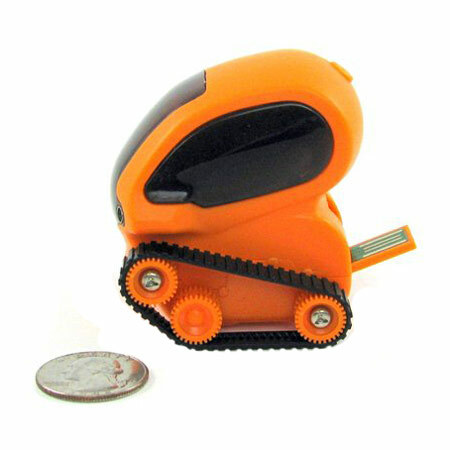 From it's bright, expressive eyes to the tiny tire tracks, Tankbot has been designed to appeal. 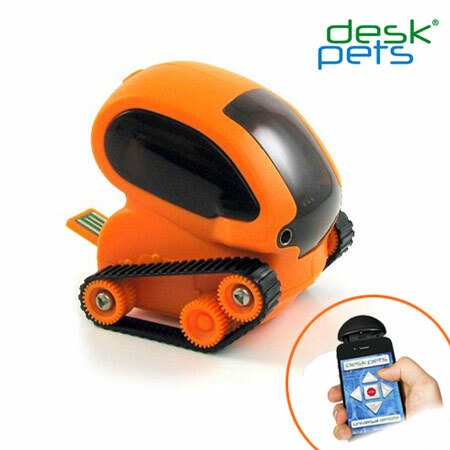 You'll instantly fall for your Tankbot, as it beeps and whirrs it's way around your home or office. Tankbot is the pet you've always wanted, but didn't want to clean up after. 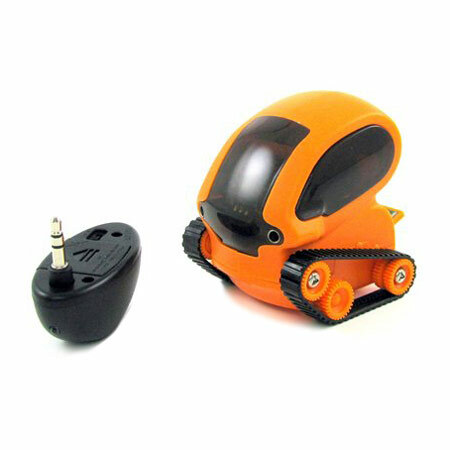 Unlike Bluetooth remote-controlled vehicles that can suffer from interference, Tankbot uses the iDeskPet Universal Remote that plugs into your headphone jack to provide an uninterrupted connection between Tankbot and your phone. The remote is compatible with all models of iPhone, iPod Touch and iPad, as well as most Android smartphones. A free universal application is available on the App Store and Android Market. 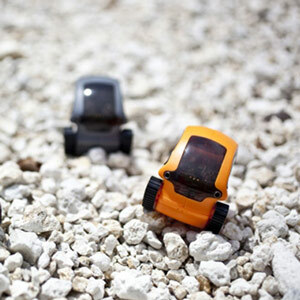 Each colour of Tankbot runs on a different frequency, so you can have races or just let them play together without worrying about crossed connections. On the back of Tankbot can be found a flip-out USB connector that lets you instantly and easily connect to a USB power source. This means you can charge anywhere you can find a computer, with 40 minutes of charge resulting in 15 minutes of play. Please note: The Tankbot is useable without a mobile phone, but requires an iPhone, iPod Touch, iPad or Android device to use the remote control features.